HÀ NỘI — Along the canals andr lakes in Hà Nội and HCM City, passers-by are used to men gathering in large groups for hours with their fishing rods, patiently waiting for the fish to come. Sometimes, the street corner is crowded with cheerful noise and claps when someone has a big catch. Their fishing occurs day and night despite big warning signs nearby saying fishing is banned. Ngô Thị Yến, a resident of Hà Nội’s Tây Hồ District, said that hundreds of residents around West Lake make a living by catching fish. Some even catch up to ten kilograms of fish every day. The illegal fishing poses possible risks to passers-by. When fishermen cast their fishing lines, passers-by might be injured by the hook. Fishermen need to spend VNĐ500,000 (US$23) per month to buy a “ticket” for fishing at Thủ Lệ Park in Ba Đình District in order to legally catch fish there. A fisherman at the park said that he could earn about VNĐ300,000-400,000 (US$13-17) per day from catching fish. Sometimes the profit can reach VNĐ500,000. Fishermen like him find it very relaxing. Fishing brings them income so he is ready to pay for the fishing fee every month, he said. A Cầu Giấy District resident, Nguyễn Văn Nhiên, who often runs around the park, said that after the catch, the fish are sold right next to the lake. These fishermen do not regard fishing as a leisure activity. They are professional and go fishing every day to increase their income, he said. Meanwhile, the involvement of authorised agencies seems to end with the putting up of ‘fishing banned’ signs. Their appearance can hardly be seen in these areas. 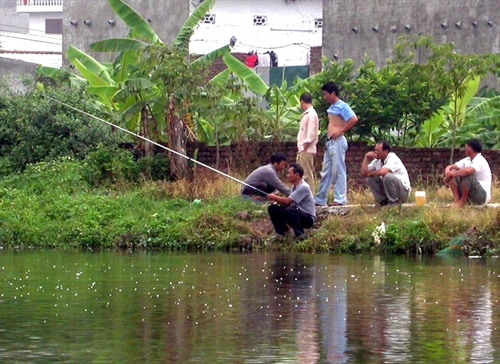 A similar situation is easily spotted along the Nhiêu Lộc-Thị Nghè Canal in HCM City. Once filled with sewage and filth, the canal has been cleaned up while local authorities have released fish into the canal to adjust its eco-system and purify the water. However, illegal fishing and garbage dumping in recent years might turn the canal back into its previously polluted state, local authorities predicted. A recent survey conducted by the Tuổi Trẻ (Youth) newspaper of over 80 locals living near the Nhiêu Lộc–Thị Nghè Canal showed that three-fourths of the interviewees find the illegal fishing pressing but do not raise their voice. Nguyễn Đắc Thọ, 72, living in District 1, used to remind young men not to catch fish in the canal. What he received back was threats from these men who said, “It is none of your business.” Since then, he has chosen to stay silent. Trương Quang Lâm, from District 3, told the Tuổi Trẻ reporter that local police have reminded them for some time but nothing has changed. Reminders are only for people to gain awareness, otherwise, violators must be penalised. In addition to catching fish, many people also bring chairs, tables and old mattresses to sit and relax while enjoying the leisure of fishing, Nguyễn Văn Khải from District 3 said. The city’s authorities have come up with measures such as confiscating fishing rods and asking violators to release their catches back into the canal, however, there are not many positive changes.